The Beinecke Library’s Walt Whitman Collection, acquired by way of gifts from various sources, contains letters, manuscripts, photographs, art, and other material dating from 1842-1949, and features the Whitmania of Yale benefactors Louis Mayer Rabinowitz and Arian Van Sinderen. The Rabinowitz gift features letters to Whitman from Civil War soldiers and former patients, galley proofs for articles and poems, many inscribed and signed by Whitman, and holograph fragments to November Boughs. A group of papers relating to Whitman’s brother George includes journal entries and letters documenting Whitman’s efforts to find his brother during the war. Whitman’s journal entries provide a rough history of his brother’s movements from an undated memo from George to his mother, in which George reveals his captivity, to Whitman’s first journal entry on December 26, 1864 describing the family’s experience after receiving George’s army trunk. The Van Sinderen gift includes correspondence, writings, photographs, art, and other material. There are letters from Whitman to naturalist John Burroughs, Julius Chambers, Moncure Conway, Boston editor Nathan Hale, William Sloane Kennedy, William Michael Rossetti, John Swinton, and his mother Louisa Van Velsor Whitman. There are letters to Whitman from family members, his biographer Richard Maurice Bucke, and journalists and writers, including Samuel Clemens, John Camden Hotten, William Douglas O’Connor, Allen Thorndike Rice, and Algernon Swinburne. Writings include articles and essays, autobiographical pieces, a diary fragment, lectures and speeches, notes and notebooks, outlines and proposals, and poetry. Writings are present in manuscript, corrected galley proofs, and printed versions. A detailed record of the collection is available online: Whitman Collection Finding Aid and digitized manuscripts and illustrations are available in the Beinecke’s Digital Collections database. Poet Mary Barnard was born in 1909 in Vancouver, Washington. In 1932, she graduated from Reed College in nearby Portland, Oregon, where she was introduced to the work of Ezra Pound. She began to correspond with the poet; the majority of their letters are now at the Beinecke Library. At Pound’s suggestion, Barnard visited New York where she met Marianne Moore and William Carlos Williams. Barnard remained in New York state for many years, first as a resident at Yaddo, an artist’s colony, and later as a research assistant to Pulitzer Prize-winning biographer Carl Van Doren. In 1940, she became curator for the Poetry Collection of the Lockwood Memorial Library in Buffalo, NY. With Pound’s encouragement, Barnard began translating Sappho’s poetry from the Greek. Her translation, published in 1958, has never been out of print. Barnard’s own poems won her Poetry magazine’s Levinson Award when she was only twenty-six years old. Her shorter fiction was published in Harper’s Bazaar, The Yale Review, and The Kenyon Review. She later composed a book-length essay in verse entitled Time and the White Tigress and researched and published her own genealogy and various essays on mythology. The Beinecke’s collection of Mary Barnard’s work is a testament to an active creative and intellectual mind. The collection includes manuscripts and first editions of most of Barnard’s published work, including Sappho: a New Translation by Mary Barnard, Time and the White Tigress, Assault on Mount Helicon, Three Fables, Mythmakers, God in the Flowerpot, High Road and Other Poems, Art of Translation, Few Poems, Collected Poems, and others. The collection also includes audio and video cassettes, her travel diaries from time spent in Europe, letters from Ezra and Dorothy Pound, Marianne Moore, and William Carlos Williams, and drafts of a translation of Homer’s Iliad. Some of the most interesting items in the collection are personal material: Barnard’s own diaries, newspaper clippings, yearbooks, and notebooks. 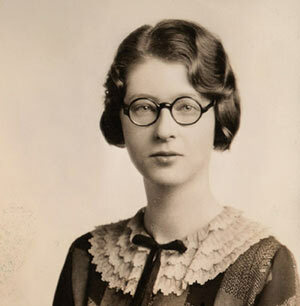 To learn more about the Beinecke’s Mary Barnard collection, search for “Mary Barnard” in the library’s Uncataloged Accessions Database: http://beinecke.library.yale.edu/acqwww/; a detailed record of the Mary Barnard Papers can be viewed at: http://beinecke.library.yale.edu/MSS_PreliminaryLists/barnard.HTM. Dr. Edward Fayette Eldridge, American physician, poet, and novelist, was born in New York in 1855 or 1857. He attended the State Normal School in Cortland, New York and graduated from Dartmouth Medical School in 1881. Eldridge practiced medicine in Boston and in Wisconsin before traveling in Europe and relocating to Grand Junction City, Colorado, in 1892. Over the next twenty years, he published poems in Grand Junction newspapers, primarily on themes relating to the natural beauty of the Colorado landscape, and authored California Girl (1902) and The Sinbad Mines: a Tale of the Rockies (1905). In 1914, seeking to improve his health, Eldridge moved to San Diego, California. He died in San Diego on March 8, 1916. The Yale Collection of American Literature has acquired the papers of poet and visual artist Ray DiPalma. The author of some thirty books of poetry and visual work including Letters, Provocations, and Motion of the Cypher, DiPalma has had a rich and varied career as poet, editor, book artist, and artistic collaborator, beginning in the 1960s. He lives in New York City and teaches at the School of Visual Arts. DiPalma’s literary archive includes correspondence, manuscripts, printed materials (largely little magazines), one of a kind book works, and documentation of collaborative projects with other writers and artists. Autograph journals and notebooks and heavily edited typescripts as well as many manuscripts of other poets and fiction writers, often with autograph corrections, are also present in the collection. Materials in the archive, such as correspondence with Charles Bernstein, Lyn Hejanian, and Ron Silliman, document the L=A=N=G=U=A=G=E Writing community of the 1970s and 1980s. The archive has a significant international component, including correspondence with contemporary French poets, editors, and translators. The Beinecke Library’s Gary Soto Papers include manuscripts, films, correspondence, ephemera, and books documenting the Chicano writer’s life and work. A Fresno, CA native of Mexican descent, Soto often writes about the experiences of working class Mexican-Americans; his writing is both political and personal. Soto has written poetry, short stories, non-fiction, children’s books, a libretto, and short films. His collection of poetry, New and Selected Poems, was a finalist for the National Book Award and the Los Angeles Times Book Prize in 1995. Soto has won fellowships from the Guggenheim Foundation, the National Endowment for the Arts, and the California Arts Foundation. He is Young People’s Ambassador for California Rural Legal Assistance (CRLA) and United Farm Workers of America (UFW). Highlights of the Soto Papers include two of Soto’s short films, The Bike and Novio Boy, and typescripts, proofs, and edits of the novels Nickel and Dime, Small Faces, The Tale of Sunlight, Taking Sides, Baseball in April, Poetry Lover, his opera “Nerdlandia”, and other works. For more information about the Beinecke’s collection of Gary Soto’s work, search the library’s Uncataloged Accessions Database: http://beinecke.library.yale.edu/acqwww/ and Orbis, the Yale University Library Catalog: http://orbis.library.yale.edu. Famous for her strong opinions about art as well as for her beauty and wit, radical editor Margaret Anderson was a key figure in American and European Modernism. Between 1914-1929, Anderson’s pioneering art and literature magazine the Little Review published poetry, criticism and artwork by many of the most significant writers and artists of the twentieth century, including William Butler Yeats, Ezra Pound, Gertrude Stein, Pablo Picasso, Hart Crane, Man Ray, Mina Loy, Wyndham Lewis, T.S. Eliot, Sherwood Anderson, and Francis Picabia. James Joyces Ulysses appeared serially in the Little Review before it was published in its entirety in 1922; the Little Review and its editors became the subjects of a widely-publicized obscenity trial when the United State Post Office deemed some segments of the work obscene and refused to distribute copies. ‘Making No Compromise’ celebrates the life and work of Margaret Anderson and the Little Review’s remarkable influence on twentieth-century arts and letters. The exhibition is drawn largely from the Margaret Anderson-Elizabeth Jenks Clark Collection, housed at the Beinecke Library; this extraordinary archive of manuscripts, correspondence, personal papers, and photographs documents the life and work of Margaret Anderson and the achievements and relationships of members of her circle of friends including Dorothy Caruso, Elizabeth Jenks Clark, Janet Flanner, Georgette Leblanc, Jane Heap, Kathryn Hulme, and Solita Solano.